We are doing this hike on a Saturday because it is a long way home afterwards, and because it is fun to do hikes on Saturday once in a while. 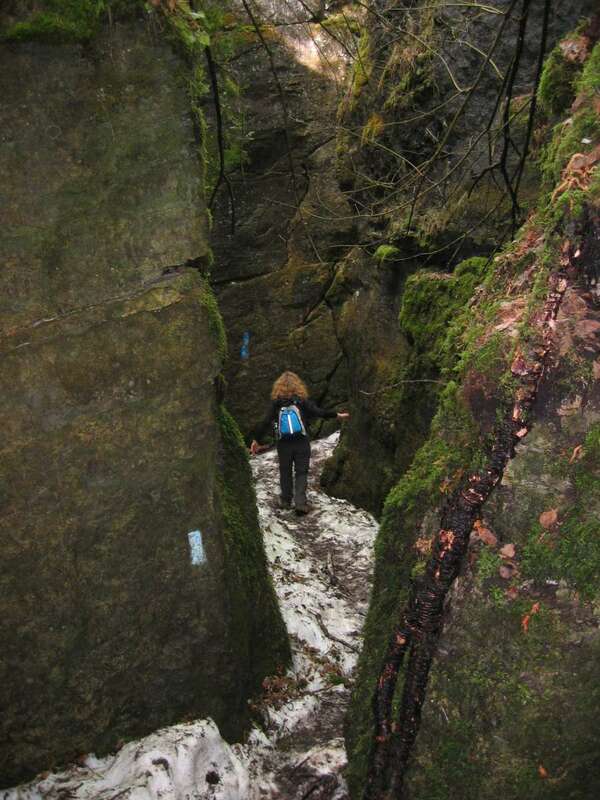 This hike is shown on Map 23 on your Bruce Trail guide. Singhampton Caves are what most of us would call crevasses. This is not a spelunking hike. The crevasses were created when huge blocks broke away from the cliff faces. At hike's end, we will head for The Sovereign in Creemore, or Mylar and Loreta's in Singhampton. It's Saturday. Who cares if we get home late! There are cliffs along several parts of this trail. These provide gorgeous views. Please, please be cautious at the edges. This is the route recommended by Google Maps. The parking lot is tiny. We appreciate people coming to Yonge and York Mills to pick up passengers and fill cars. From Yonge and York Mills, go east on the 401 to Highway 410. Make sure you are in the collector lanes. Go north, all the way, on Highway 410 until merges with Highway 10. Continue north on Highway 10, passing through Orangeville. At the lights at Highway 89, turn left and drive towards Shelburne. Actually, you still are on Highway 10. The next traffic lights should be Simcoe Country Road 124. Turn right, and drive north to the town of Singhampton. At Singhampton, Road 124 turns right. Do not follow this. Continue driving north on what is now Osprey/Clearview Town Line. The next right-turn intersection will be County Road 91, possibly signed as Duntroon Road. Turn right. You will pass a quarry on your right. The Bruce Trail parking lot will be on your left, the north side, at the top of a big hill that drops off to the east. We will try to get started at 12:00. This hike is rated as a Level 3 hike, with lots of rock scrambling and squeezing through narrow defiles. Hiking boots are strongly recommended. The distance will be around ten kilometers, and the pace moderate.